Co. Tyrone: Crockanboy, Fallagh, Glenchiel, Glenlark, Glenroan, Gortin, Lislea, Loughash, Mount Hamilton, Moyle (2), Plumb Bridge, Stranaganwilly, Trinamadan. The Board also included 2 ex-officio Guardians, making a total of 16. The population falling within the Union at the 1831 census had been 17,315 with divisions ranging in size from Mount Hamilton (population 592) to Moyle (2,867) and Gortin itself (2,226). The new Gortin Union workhouse was erected on a three-acre site at the east of Gortin. Designed by the Poor Law Commissioners' architect George Wilkinson, the building was intended to accommodate 200. Of all the workhouses in Ireland, only nearby Castlederg had a capacity this small. Gortin's construction cost £2,689 plus £711 for fittings etc. The workhouse was declared fit for the reception of paupers on 17th February 1842 and admitted its first inmates two days later. The buildings lacked the single two-storey entrance block normally found at the front of the site — a feature also found at Ballycastle, Castlederg and Dunfanaghy. Instead, two small blocks probably contained the porter's room, Guardians' board room, and reception wards. The T-shaped main accommodation block had the Master's quarters at the centre, with male and female wings to each side. At the rear, a central spine containing the dining-hall, chapel, and utility rooms connected to a small infirmary at the rear. During the famine in the mid-1840s, an extra storey was added to the infirmary, and a shed was constructed to accommodate a further 8 inmates. A 36-bed fever hospital was also erected. Because of the Union's small size, the posts of Union clerk and workhouse master were initially combined, with Daniel McFarland being the first appointee. The posts were however subsequently separated with McFarland's son becoming clerk. The Gortin workhouse was very little used and, following a petition from the Gortin Board of Guardians, the Local Government Board dissolved the union on 26th March 1889. The unions electoral divisions were distributed between the adjacent Omagh and Strabane unions. 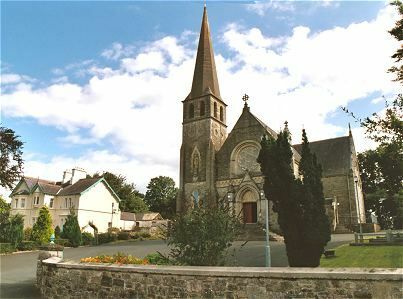 After a period of disuse, the building was bought by Patrick McCullagh, a local merchant, and donated to the Roman Catholic bishop of Derry. The building was then demolished, with some of the stone being reused in the construction of a new Catholic church on the site. Gortin workhouse site from the west, 2003. The fever hospital was converted into a manse for Gortin's Presbyterian minister. 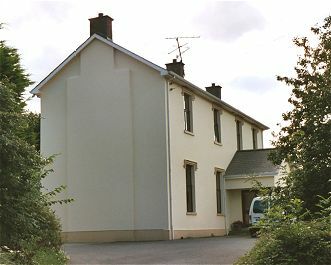 Gortin fever hospital from the north-west, 2003. Public Record Office of Northern Ireland, 2 Titanic Boulevard, Titanic Quarter, Belfast BT3 9HQ. Holdings include Board of Guardians' minutes etc.